Former BBC One and Channel 4 boss Michael Grade has been confirmed as the new BBC chairman. The former BBC executive, 61, takes on a role vacated by Gavyn Davies, who resigned in the wake of criticism in the Hutton Report in January. Mr Grade has immense media experience and was among the favourites to get the job despite his maverick reputation. He said he was "proud and delighted" to get the job and will take the lead role in appointing a new director general. "This is quite a day for me," he said. "I would like to thank those who appointed me for having the courage to break the mould." He praised Mr Davies for showing "great courage and dignity" in how he had handled his resignation. Mr Grade said the editorial independence of the BBC was "paramount" in maintaining the support of the viewers and listeners. "It is my job, and the job of the whole board, to ensure that the BBC can continue to earn public and parliamentary support," he said. He said he would ensure "the provision of universally available, value for money, public service broadcasting is neither jeopardised nor marginalised". "Nothing must be allowed to deprive our children and our grandchildren of the rich experience we have come to expect and enjoy these past decades from the BBC." Announcing his appointment on Friday, Culture Secretary Tessa Jowell said Mr Grade was "the right man at the right time". Later she told BBC News 24 that Mr Grade was "no pushover", adding: "I have worked well with Michael as chairman of Camelot." Congratulating his successor, Mr Davies said: "The prime minister has had the good sense, as I knew he would, to appoint a strong, independent and popular person to this vital job. "Far from wilting at a time of crisis, the BBC is ready to attain new heights under Michael's leadership." BBC media correspondent Torin Douglas said the selection of Mr Grade would not be seen as the choice of a "safe pair of hands". Douglas said: "He's very much an independent person, independent of government - he believes in journalism, he believes in creative programme-making." He told BBC News 24: "He believes in audiences watching and listening to programmes. But that does not mean he is merely a populist." Mr Grade will take up the £81,320-a-year post for four years from 17 May. The appointment was made by the government after interviews were conducted last week by an independent panel, headed by a civil servant. Mr Grade, a former director of BBC Television, will now have to appoint a new director general to replace Greg Dyke. Mr Dyke welcomed the news of the new chairman. Acting director general Mark Byford said Mr Grade was one of the major world figures in broadcasting with an outstanding record of achievement. "It's great that Michael is coming back to the BBC and he will enjoy the full support of the whole organisation," he said. Acting chairman Lord Ryder said Mr Grade would find a "united" board of governors optimistic about the future. 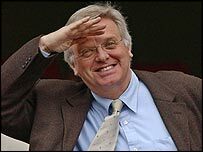 During his time as chief executive of Channel 4, Mr Grade was not afraid of controversy, being labelled "pornographer-in-chief" by the Daily Mail. He comes from a showbusiness family, having television mogul Lord Grade, a pioneer of ITV, as his uncle. As well as being director of programmes at London Weekend Television and BBC Television, he went on to head the merged Pinewood and Shepperton film studios. As BBC One controller in the 1980s, he launched top-rating soap EastEnders - but axed sci-fi favourite Doctor Who. Mr Grade also applied and was shortlisted in 2001 before then vice-chairman Davies was selected. The BBC has announced that Mr Grade will be resigning from the boards of Camelot, SMG and the Television Corporation before 17 May, as well as from a number of other commercial and pro bono appointments. He will retain his non-executive chairmanship of Pinewood Shepperton and the Chairmanship of Hemscott Group Plc. "The editorial independence of the BBC is paramount"
Quiz: Do you make the Grade?